Please join me at the Pierro Gallery in South Orange NJ for BREAKING THROUGH TRADITION, a group show celebrating the American cultural transition towards inclusivity. My HE-SHE portfolio presents an ongoing series of portraits documenting my seventeen-year collaboration with French artist, Fred Koenig, who unselfconsciously dares the viewer to cross over boundaries of imagination and desires. Observe him in ‘The Sea Change’ and be confronted by a fearless man who is empowered and transformed by the ambiguity of his sexuality. ‘Ravaged,’ presents Fred within the decaying landscape of a New Jersey historic farmhouse. Perhaps this intimate pose and an abandoned structure lay bare a similar beauty and vulnerability. Fred and I collaborate not just in our art, but in our political activism. Talking about his HIV/AIDS status, Fred told me that it is part of what he shows me by exposing his soul to my camera. ‘Changed Landscapes’ also reveals a figure who has dared me to look deeper because she wasn’t afraid. Here is a woman who bravely explores the physical and emotional contours of her new form after a double mastectomy. This portrait can be viewed as a narrative about her life and as a defining moment of transfiguring change. 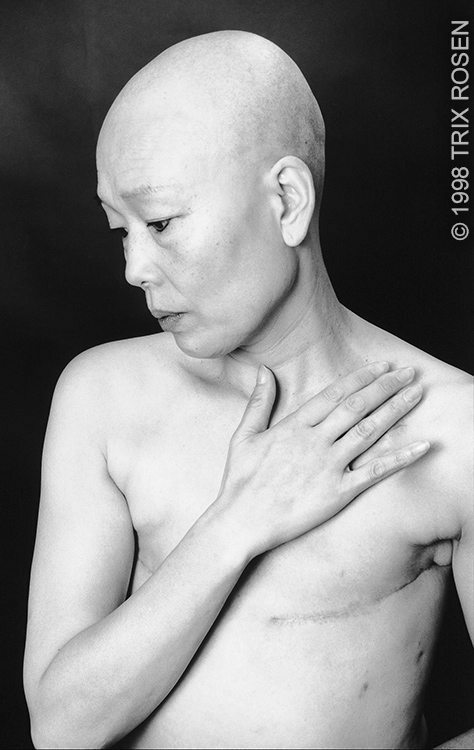 Bald, breast-less and scarred, she is fearless and beautiful, essentially and eternally female. These images record biographical moments, measured not as isolated fragments of time, but revealing the narrative arc of both Fred and Takami’s life. They are capturing the past, recording the present and projecting into the future. How courageous and optimistic to look inward and become stronger through the experience.